A short while ago I undertook a self imposed ten pin bowling project. I posted a few of these pics on Flickr after I’d shot them, but wanted to pull the whole project together so you could get an idea of the thinking behind the images. Since I was a teenager I’ve always been a big fan of Ten Pin Bowling and I’ve been known to put together a reasonable score myself occasionally. Now if there’s one sure way to get my creativity all fired up, its when two passions collide. 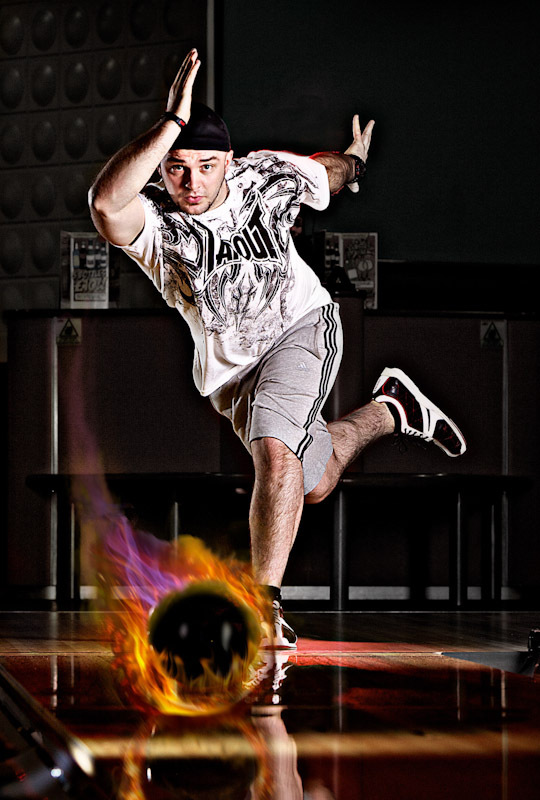 So I set about contacting and organising a shoot at the local AMF Bowling centre. The guys there were super helpful and they recommended I went along and ask some of the better league bowlers for their help. I duly went along and convinced a few of them to come along and model for me. My aim was to capture a classic bowler in full extension and then use some pretty edgy lighting to make the whole thing pop. The bowling centre was very obliging and let me have free rein to go nuts and occupy a few lanes to set up lighting gear on. I tried to keep the kit fairly light and portable as this reduces the risk of damaging the lanes with light-stand legs, I also wanted a fairly dark feel to the shot so controlling the spread of light was going to be important. The Elinchrom Quadra head was set up as the key light and positioned aggressively to encourage a cross lighting effect, I added the strip light modifier with gridded front to concentrate and control the light spill. To add some balance and stop one side being plunged into darkness I setup a speedlight from the adjacent side to act as a fill and help with background seperation. I wanted to drop the ambient light to intensify the mood and to reduce the background clutter, so behind the bowler I set up a another gelled speedlight to provide some further separation. One of the first issues I came up against was getting enough light onto the released ball mid-way down the lane, so I set up a further gridded speedlight further down the lane to catch the balls movement down the lane. This was going to cause some timing issues as I’d have to time the shutter release to co-incide with the balls position on the lane. Tricky. Also the slight (albiet it fraction of a second) delay was going to cause the bowlers some problems holding their pose and intensity. The pic to the right shows the key light camera right and the gridded speedlight to camera left to catch the bowling ball. This shot also demonstrates that the timing was going to be critical. I experiemented a littel with some wide angle shots but ended up loading up with a 70-200mm lens and positioning myself flat and pretty far down the adjacent lane. Using a telephoto lens would help with perspective compression and draw the viewers attention to the bowler rather than the peripheral areas. After the shoot I have to admit to going a little nuts in Photoshop and comp’d some fire around the ball. Initially this was to mask the fact that some of the balls didn’t quite make the spot lit area on the lane, but after I was pretty pleased with the result and so I pressed on safe in the knowledge it was my project to go a bit nuts on. I increased the contrast of the bowler, ramped up the textural qualities, increased the bowlers saturation slightly and dropped the background down to provide a hyper-realistic effect. I also removed the back light and added a small vignette. I like it and I hope you do too. Click on the main images to see others from the shoot. You’ll also see a before and after of the main pic. One of the bowlers (Chris Maffei), as featured in the main pic, shot some BTS video on his phone and although it’s not BBC quality it does show the set up and my positioning for some of the later shoots. If I had to do it all again and I would like to revisit this project again sometime, I’d go for a themed 50’s bowling setup. Classic retro-looking bowling alley, I’d really got to town on the clothing and hair from that era. Looking at the resultant pic with my commercial photographer hat on, I think the post-production is too much and although it appeals to my taste, for the client I think it’d be too stylised. What’s next? 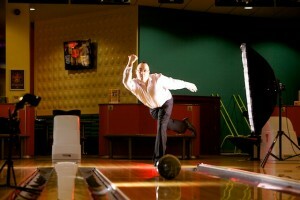 After this shoot I went back to the bowling centre to photograph the back of the lane where the pins get smacked about. That’s a topic for a forth coming post so check back soon. If you’ve got a project you’ll like me to take a look at please get in touch. The quirkier the better. Thanks for reading this far. Big thanks to James from AMF Bowling Bury for allowing the shoot to happen and to Bowlers; Nathan, Chris and Josh for giving up their valuable time – you’re legends. Also thanks to my assistant Clive his patience and persistence.